Main Floor Carpet One Floor & Home in Royal Oak is your locally owned flooring retailer. Usually the first thing to go during an update or remodel is the flooring, and we have you covered. With vinyl flooring, you won’t have to sacrifice style for function when it comes to your floors. Vinyl flooring is made to look stunning and also provide incredible durability. Our flooring professionals are here to guide you through our vinyl flooring selection and help you choose the best floor for your next project. Although we offer both water resistant and waterproof vinyl options, we recommend installing waterproof luxury vinyl in your kitchen. Commonly, you will see a waterproof luxury vinyl tile installed in kitchens and bathrooms because it stops moisture from penetrating the floor and causing damage to the subfloor. It is also a great alternative to traditional tile flooring. Sheet vinyl flooring is also a waterproof option, as the moisture will simply sit on top of the floor until you can wipe it up. Sheet vinyl flooring is available in authentic tile and wood looks just like luxury vinyl planks and tiles. Your kitchen sees moisture on a daily basis, and your floors should be able to protect themselves. Vinyl and luxury vinyl flooring are just as easy to care for as traditional tile flooring. 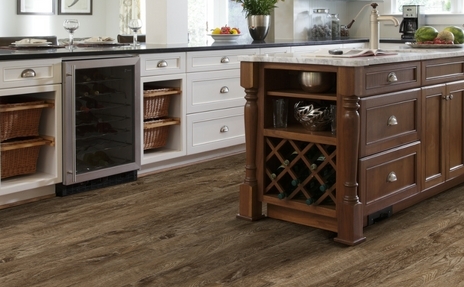 Waterproof luxury vinyl has changed the way homeowners look at flooring in their kitchens. These vinyl floors are still able to replicate the authentic looks of wood, tile, and stone all while protecting themselves and your subfloors from unwanted moisture. You can have the look of wood flooring in your kitchen without the worry of moisture, heat, or foot traffic causing damage like cupping and warping. If you want to learn more about the possibilities with luxury vinyl flooring in your kitchen, then visit our showroom or give us a call!